Hi, Guys, recently I working hard on translating the getstart manual. 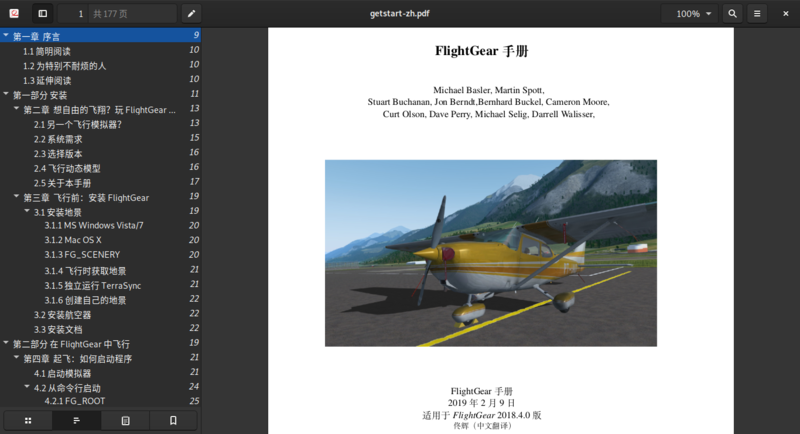 For about two month intense working, the Getstart Chinese translation for FlightGear 2018.4.0 was fully completed ! The Chinese translation covers the whole manual from the very beginning to the end, every installation instruction, every tutorial, and even appendixes. That means every detail are translated. Beside for easier understanding, I added some Translatior's Note for Chinese people. Note that, I am not a Latex expert, as the result I have to make several "dirty" hack to adopt CJK characters, such as replace the building command from pdflatex to xelatex (for adopting xeCJK package, and more Chinese fonts), even remove some English and other language content. So that, after that it only working in Chinese language, and only pdf version working, I still working on fix these issues. So I need some expert's help to solve these known issues. 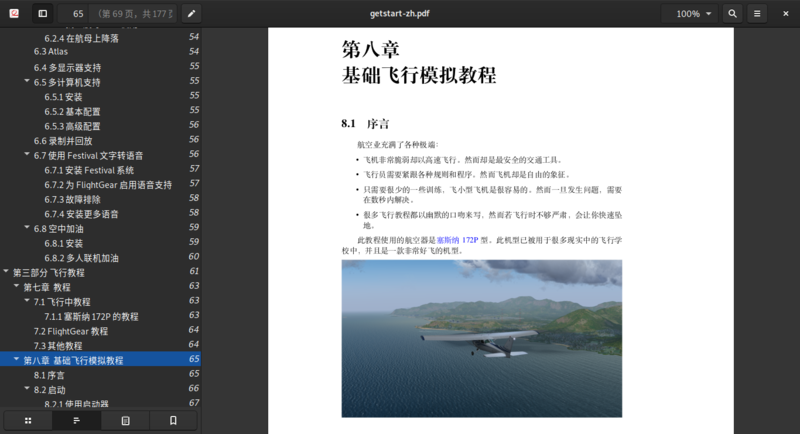 I am volunteering to maintain the getstart document Chinese version, to improve and translate this awesome document. If it available add my Chinese translation to official repo would be OK, but I know it may impossible, cause It add several hacking may conflicting existed code, so I suppose creating a standalone branch named "zh" or something like this. Furthermore, we could spirit every language to it own branch, and clean up the source code, it may helpful for English writing and translation. My translation repo: https://github.com/tonghuix/getstart-zh README file would tell you how to generate it. 2018.4.0, add more new content - Launcher, tutorials and corrected training manual etc. Fix a lot of translation errors and format bugs. Use Fandol fonts and Noto Sans CJK fonts instead, makes the book more beautiful and print-friendly. Add more footnotes that help reader understanding some important knowledge, such us aeronautical knowledge, aerodynamic or flight maneuvers. Add TravisCI for build and continues deployment (still failed). Last edited by tonghuix on Sat Feb 09, 2019 2:13 pm, edited 3 times in total. That's absolutely superb work. Well done and thank you for taking the time to do it. I'd like to include it within the standard installation, so anyone who downloads FlightGear can benefit. Would that be OK? Thank you very much! It is my pleasure! I would try my best to catch up the new 2016.1.0 release, so when everybody download the latest release would gain the latest Chinese manual. Now available for ready release version 2016.1.0 ! Thanks again for taking the time to do this. I have checked in the pdf version into fgdata so it will be included as part of the 2016.1.0 release. Out of interest, is there a large FlightGear Chinese-speaking community? The good news is there was a Chinese-speaking forum that already listed in FlightGear homepage http://www.flightgear.org.cn/forum.php. The bad news is the forum not so active and no mailing list, no IRC, no any other FOSS community should have, yes it's only a forum. And most documents there are all out of date, the forum build up in 2011 or later 2012, after that not so many people active recently. Why I translating and do some l10n for FG, because I want to contribute to upstream and try to building and improving a FOSS-style community in the future. i want the manual of 3.4.0 but there's just the 2016.1.1 from you link, can you keep the old version? New translation, for 2018.4.0, release!